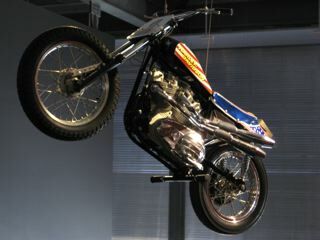 During my visit to the Harley-Davidson Museum earlier this summer I spied a XR-750 hanging from the ceiling. Turns out it’s a replica of the one that motorcycle daredevil Evel Knievel (Robert Craig Knievel Jr.) used at the Los Angeles Memorial Coliseum in 1973 when he attempted to jump a 50-car tower. Evel having a colorful life is a huge understatement. Born in Butte, Montana he battled the IRS and Montana over allegedly unpaid taxes; survived abandonment by his parents, who left him with grandparents at 6 months old; endured jail, bankruptcy and divorce – he even ran over a Hells Angel – and survived to tell the story! The official Knievel web site is HERE. Evel passed away last year, but as a small tike, I can remember to this day the excitement of watching that X-2 Skycycle launch over the Snake River Canyon to be followed with disappointment of the parachute accidentally deploying and to land only a few feet from the water on the side of the canyon. In an effort to break Evel’s record, last weekend Bubba Blackwell (the professional daredevil) set the record and jumped 52-cars in front of a crowd of more than 6,000 at the Deep South Speedway on his modified Harley-Davidson XR-750. It was also his birthday. Next up for Bubba has to be getting his life interpreted via rock opera format? Then you’re golden. Congrats Bubba in setting a new record and happy (belated) birthday!